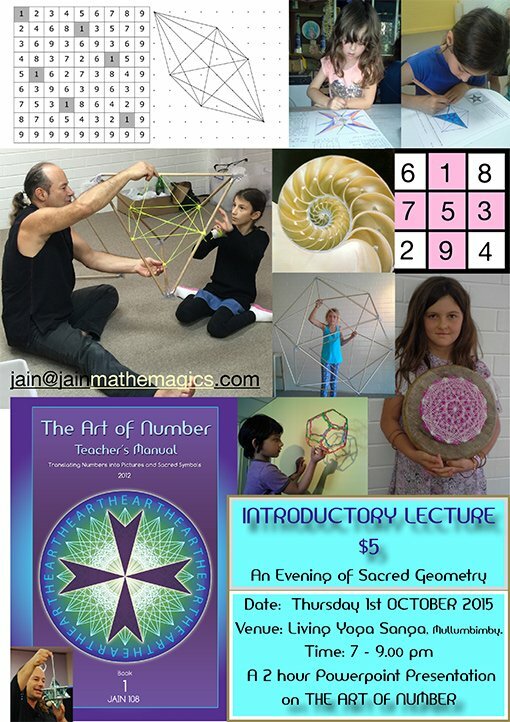 Due to high demand for extra-curricular, private home lessons on Sacred Geometry, I will be giving public classes in Mullumbimby town, at the Living Yoga Sangha (above the Newsagency) for Term 4 this year, for 2015. I will be running a 6 week Certificate Accredited Course. all of which are very important topics for the budding genius. Jain is an international lecturer on Sacred Geometry and Vedic Mathematics. in his program called “Mathemagics” that teaches the translation of Number Sequences into Atomic Art. Sino-Tibetan Lo-Shu aka Magic Square of 3×3. Uni-Cursal Hexagrams and Fractality and much more. ~ Certificate Accredited Courses each School Term. (this is the Early Bird date) otherwise individual classes are $30 each. All Welcome, $25 per 1.5 hour class. Limited spaces available due to contents being filmed. 3.30pm to 5.00pm. Limit to 15 students. 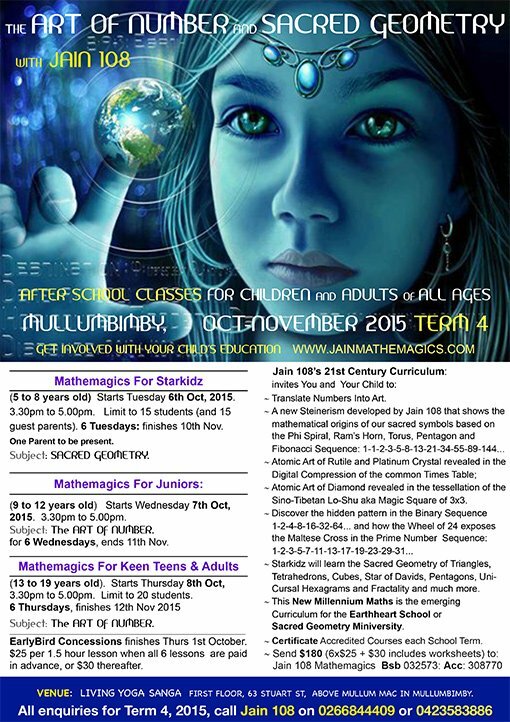 6 Tuesdays in Oct-Nov. One Parent must be present. Subject: The ART OF NUMBER. 3.30pm to 5.00pm. Limit to 20 students. 6 Wednesdays in Oct-Nov. No Parents. 6 Thursdays in Oct-Nov. No Parents. * Worksheets for all classes are supplied. * Certificates are given to all students who complete this 6 week course. The Living Yoga Sanga, 1st floor, 63 Stuart st, above Mullum Mac in Mullumbimby, 2482, Far North NSW. inland of Byron Bay. = $180 and all 6 classes must be paid in advance. Earlybird Registrations = $180 before the 1st October. (Bookings after this date will be $30 per class, total of 6x$30 + $30 worksheets = $210). For every lesson, please bring your own pens, lead pencils, colour pencils, rulers, erasers, A4 notebook, compass (for teens only, please buy or use good quality metal compasses, not cheap plastic ones).